Edith Simcox was born in 1844. The Capacity of Women appeared in the journal Nineteenth Century in September 1887. 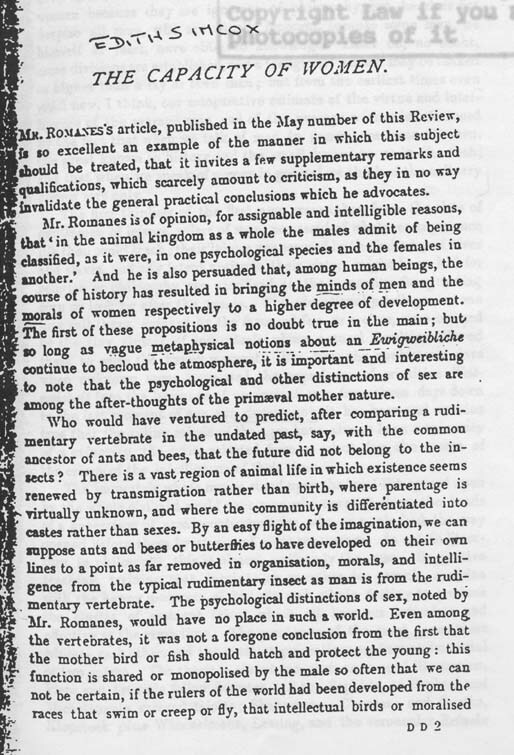 In this essay she argues that George Romanes’ evolutionist polemic in Mental Differences Between Men and Women (Nineteenth Century, May 1887) is misguided. In that piece Romanes suggested that women are inferior intellectually because they have been poorly educated and that their “inferiority displays itself most conspicuously in a comparative absence of originality.” Simcox proposes that Romanes’ claims are based more on stereotypes than on a critical examination of women’s accomplishments. She centres the issue of women’s advances on an analysis of class, arguing that “the ruling minds of the ages have always been a minority of a minority.” Simcox further argues that women have the right to pursue a career outside the home; that thwarting women’s attempts to pursue work of their choice is ultimately a crime against intellectual and social progress. Her other writings indirectly critiqued the form of capitalism then prevailing in Western Europe, and argued that women in ancient Mesopotamia, Egypt and China had enjoyed higher status than women in Victorian Britain. Simcox died in London in 1901.